Aam panna, a green mango drink, is a cooling summer drink that we used to have in India. Spicy Aam panna drink is also popular as it makes a good base for alcoholic drinks. Usually, mango is considered as “no no” for diabetic people. But recently American Diabetes society suggested that mango, especially green mango is actually good for diabetic people. Glycemic Index: The glycemic index, or GI, of a particular food, indicates the effect it has on blood sugar, specifically how fast the carbohydrates turn to sugar in the bloodstream. Foods with a glycemic index of less than 50 are low-GI foods. A score of 50 to 70 indicates a moderate GI, while foods scoring 70 or above are categorized as high GI foods. Glycemic Load: Glycemic load takes into consideration how much of a carbohydrate is in a particular food, a factor that directly impacts its effect on blood sugar. The glycemic index for 120 gm of mango is 60, which qualifies the fruit as moderate on the glycemic index scale. However, because green mangoes have a high water content, the amount of carbohydrate by weight makes the glycemic load score a 9. So green mango is a low-glycemic-load food. Mangoes contain fiber and lot of minerals and vitamins including vitamin C, A, E, and K, as well as a range of vitamin B. In addition, mangoes provide polyphenols, triterpene, and lupeol. These compounds have antioxidant and anti-inflammatory properties. Most importantly mangoes have a substance known as mangiferin—which, in addition to anti-inflammatory and anti-viral activities, also can help lower blood sugar levels. Research indicated that other components in mangoes including quercetin and a derivative of mangiferin can modulate the same cellular constituents that are the targets of the anti-diabetes drugs, the thiazolidinediones also known as the glitazones. 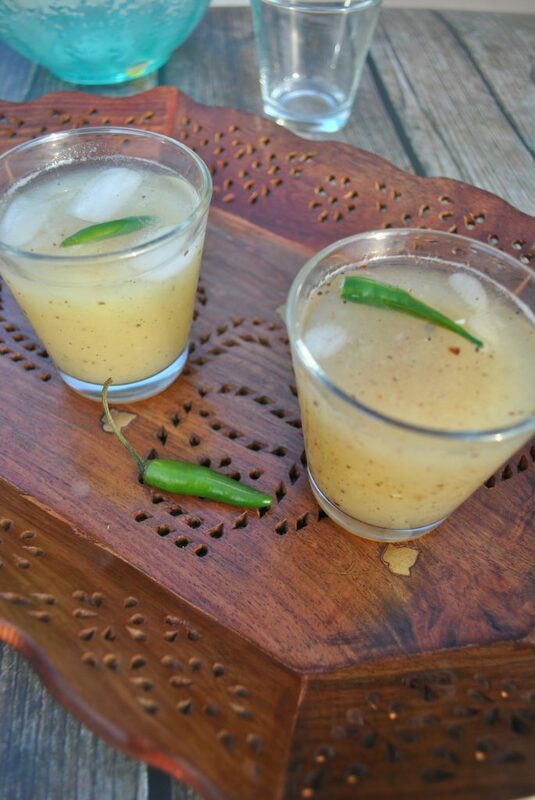 It is a 3 step process to make the Spicy Aam Panna – Green Mango Drink. In order to extract the green mango pulp, slice the green mango and boil the slices in 1 cup of water until the mango softens. Once the mango cools down, take out the skin and separate out the pulp. After that make a smooth pulp of the boiled green mango using a electric mixer. Two main spices needed for this drinks are Black Salt and roasted cumin/ dried red chili spice, In order to make the roasted cumin/ red chili spice, roast cumin and red chili in a non-stick pan. Once it cools down, crush it to powder in a coffee grinder. Add water to the pulp, add black salt, sugar (or sugar substitute), roasted cumin/ red chili. Garnish it with Thai green chili. Aam Panna or Greem Mango drink, is a refreshing drink to enjoy during spring or summer. It is also very good for controlling blood sugar. Roast 2 teaspoon of cumin in non-stick pan until it turns dark. Once the roasted cumin and red chili cools down, grind it in the grinder. In a Mixer make a smooth pulp of the boiled green mango. Add 4 ounces of water. I took a break from blogging in the last few weeks, as I was going through some changes in my professional life and a huge change in my family life. My husband has been officially diagnosed as Diabetic. He was pre-diabetic for a long time. But he was able to resist it for many years by playing cricket and other sports. My husband is a big foodie. He not only enjoys food, he is the best critic of my cooking. Now I have a big responsibility of cooking diabetes-friendly, tasty food for him. He is measuring his blood sugar after two hours of eating lunch and dinner to find out how his blood sugar is fluctuating based on the food he is eating. Here is our first discovery. Chana Dal, also known as Gram Dal (or Chholar dal in Bengal, the part of India I am from) is very good food for controlling blood sugar. I cooked Chana dal fry, a spicy, tasty dal recipe to have with whole wheat roti (homemade Indian Bread) and it did the magic to bring the blood sugar down to a great extent. 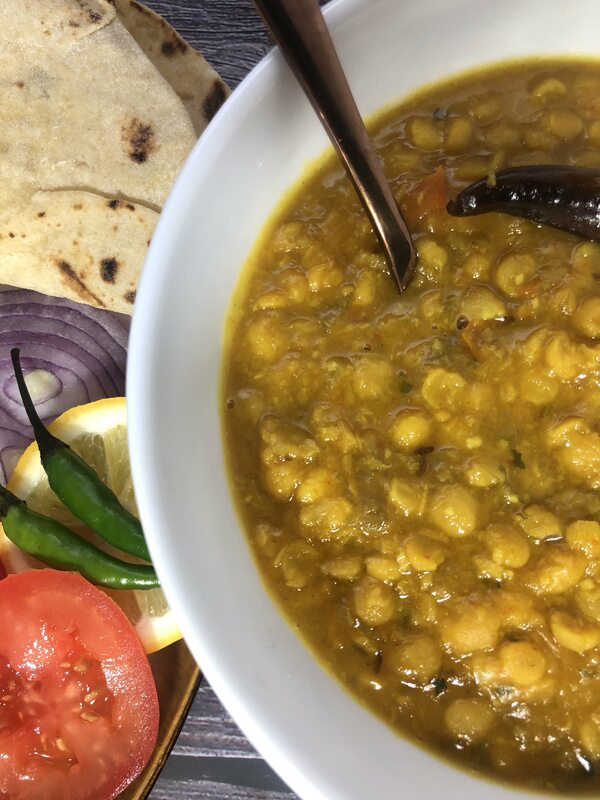 For Chana dal, even though two-thirds of the calories come from the carb, the glycemic index for chana dal is only 8%, whereas the glycemic index for garbanzo bean is 36%. Cooked chana dal is rich in Folate, Vitamin B9 or Folic acid which helps our body to produce red blood cells. 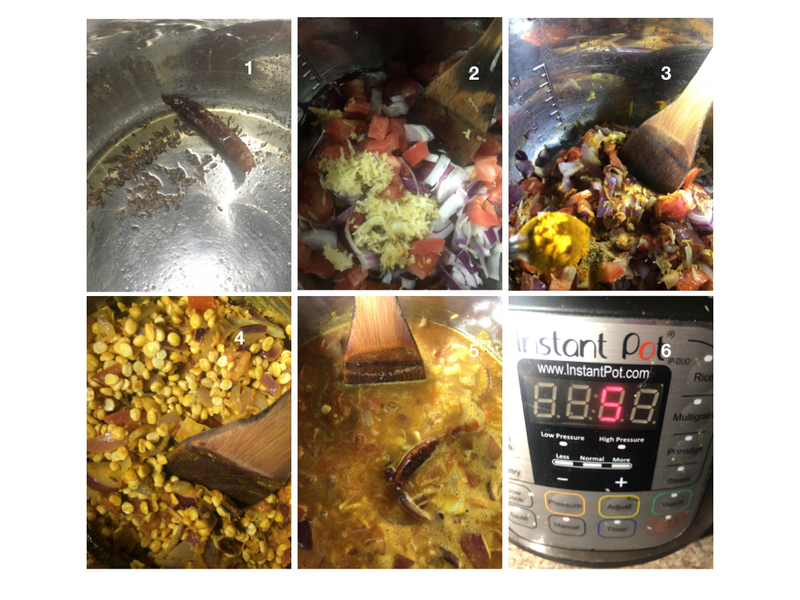 So here is my favorite one pot recipe of Chana dal using Instant Pot. First, wash the chana dal and let it soak for a few minutes if possible. Usually, as I am in rush most of the time, I do not get the time to soak the dal. So it is ok if you do not get the time to soak the dal, you just have to pressure cook it for a longer time. Cut the onion, tomato and grate the ginger, garlic. 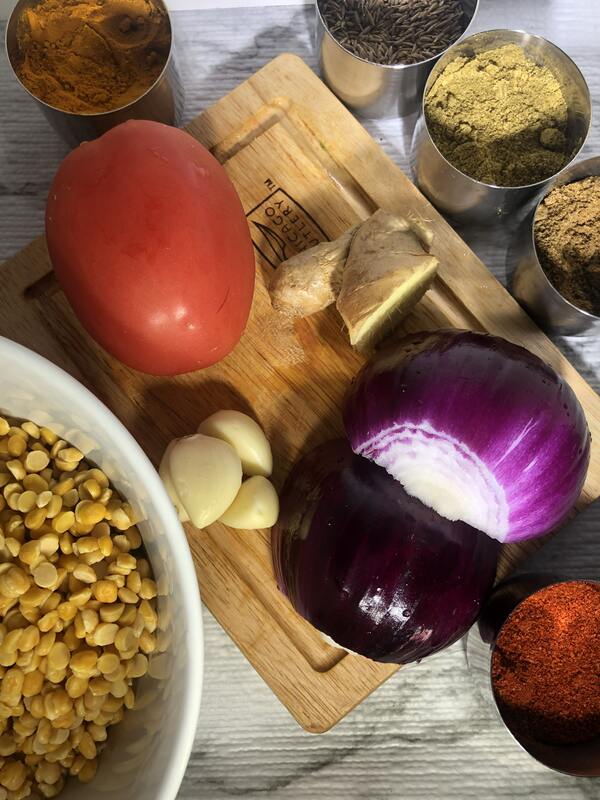 Now you are ready to start cooking chana dal fry. It is time to have your instant pot ( or any pressure cooker) ready for cooking. Turn on the instant pot in sauté mode, add ghee and the seasonings – cumin seeds, dried red chili. Once the spices start to sizzle, add onion, ginger, garlic, tomato and sauté it for a couple of minutes. After that add the powdered spices – cumin, coriander, turmeric, chili powder and sauté it for a couple of minutes. Add soaked dal, water, sugar, and salt and close the instant pot. I added 2 cups of water for 1 cup of chana dal and let it cook in high pressure for 5 minutes. If the dal does not get completely boiled, then put the instant pot in high pressure for a few more extra minute. At the end add kasuri methi and let it stand for a couple of minutes before serving with roti or rice. Add tomato and fry it for one minute. Add cumin powder, coriander powder, turmeric powder. Add water and close the lid of the instant pot. After 5-minute pressure cooking is done, release the pressure from Instant pot and open the instant pot. Add Kasuri methi and let it sit for couple of minutes. The dal is ready to serve with roti or rice. You can add extra ghee at the end. It always tastes good with the flavor of ghee. I use a little bit of sweetness in my cooking to balance out the taste. But it is completely optional to add the sweetness.